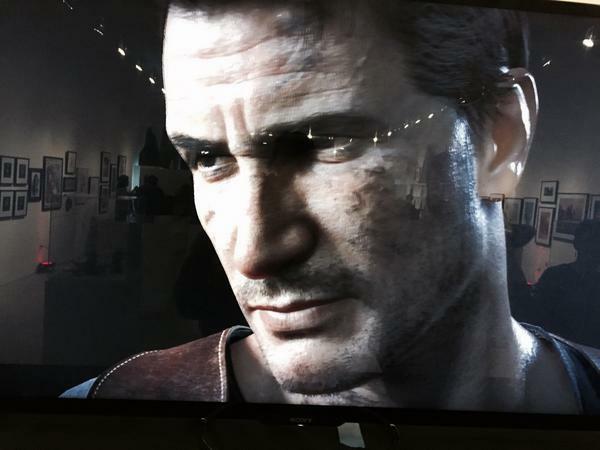 Uncharted 4: A Thief’s End lead game designer Kurt Margenau has shared a new image of what Uncharted hero Nathan Drake will look like in the upcoming game, due out in 2015 for PlayStation 4. He snapped the shot at the Naughty Dog 30th anniversary art exhibit, which is currently on display at a the Gallery Nucleus in Alhambra, California. The exhibit premiered on September 27 and runs through October 12. You can read more about it in this post. It is unclear if the image of Drake you see above represents what he will look like in-game or only through cinematics. A teaser trailer for the game released in June 2014 gave us a first look at how Naughty Dog had re-designed Drake for the new game. This image matches up with what we saw before, in that Drake’s hair is now graying, he appears somewhat thinner, and his face is scruffy and slightly bruised. Naughty Dog said previously that A Thief’s End will tell a “more personal” story that delves into who Drake is a person. “It’s his greatest adventure yet and will test his physical limits, his resolve, and ultimately what he’s willing to sacrifice to save the ones he loves,” Naughty Dog said in June about the game. The game also promises to be an “edge-of-your-seat” roller coaster ride.